Keeping dressing for the office during pregnancy as simple as possible in the third trimester, I've been relying a lot on my wrap dresses - both maternity and non maternity ones. I was eager to wear this dress again to the office. Although I bought it a size larger than usual so it would fit the third trimester baby bump, it's still not a maternity dress so I'm not sure how many times I'll be able to wear it before the bump outgrows it, and I'm trying to make the most of it while I can! I thought the magenta bag might be a bit of a bold pairing with the turquoise print on the dress, but really liked the way it looked. I'm glad I bought this dress! It was an impulse buy in the sales and I wasn't sure if it would even fit around the bump, but I've been really pleased with it. I know I'll be able to wear it post-baby so I think it was a good pregnancy purchase. It's super comfortable for the office too. A purchase I'm glad I made, that will be worn now and after baby arrives. Last worn: brown marle singlet, Atmos&Here Betsy wrap dress, Marc by Marc Jacobs flats, Balenciaga magenta day bag. Other ways to wear: brown marle singlet and a maxi skirt, turquoise wrap dress and navy tote bag, Marc by Marc Jacobs ballet flats and skinny jeans, Balenciaga magenta day bag and a maxi skirt. Unlike the two bright colours together above, this is the magenta bag worn with a neutral dress. As much as I liked the colour combination in the first outfit, I think the magenta popping against a neutral outfit is my favourite way to wear it. Just like last time, I'm starting to feel that I'm wearing this dress a lot over my pregnancy, but it's such an easy outfit option for work! 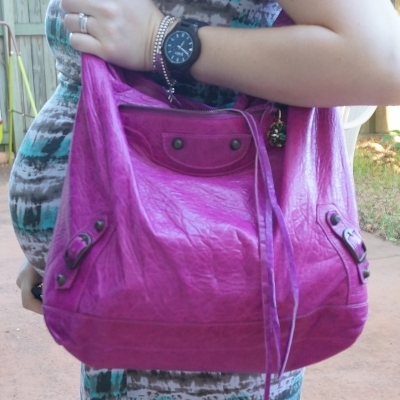 Last worn: grey tank, Soon Maternity wrap dress, cap toe flats, Balenciaga magenta day bag (above). Other ways to wear: grey tank and a maxi skirt, maternity wrap dress in the second trimester, printed jeans and two tone flats, Balenciaga day bag with a pencil skirt. Linking up with Modest Monday, Mix It Monday, Classy Monday, On Trend, Style Sessions, Turning Heads, Wardrobe Wednesday, What I Wore, What I Wore to Work. These wrap dresses look perfectly suited for your pregnancy bump! Thanks for sharing! Wrap dresses are always so flattering, whether you are pregnant or just got a bit of a food baby! It's definitely a really useful style to nail! That necklace you paired with the first dress was the perfect accessory for your outfit! Wrap dresses are the cutest on a baby bump!! Such a cutie as always. Love the print on that top dress. I remember the second one from last time. It's such a great maternity piece! Your bag is so fun. Love these baby bump looks! I'll definitely be sharing these with my future mom to be friends! Such lovely dresses, Mica! I love wrap dresses because they're so flattering and in your case, really compliment the baby bump. Plus, they are super comfy, too! Thanks so much for sharing and I hope you're having a wonderful start to your week so far! They are, so flattering and comfortable! both of this wrapped dresses are lovely...and that pink bag is fantastic! you look radiant sweeetie. I hope you had a lovely weekend and I wish you a great week. The dresses are both perfect on you! And I'm still crushing on that bag! I always love a wrap dress and your bump looks so cute in them! I love wrap dresses in general (although I have to admit I don't wear them I just like the look of them). 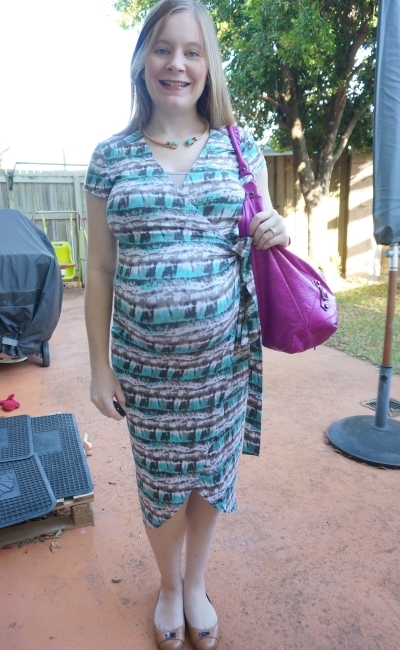 I forgot about a corporate kind of outfit when you're pregnant, but I love this idea of wrap dresses. Plus, they look really comfortable! You look really great considering that you are in your trimester , ilove the bag . I love the pattern on that top dress! The pink bag is so pretty too. I found wrap dresses to be the most comfortable item to wear in my third trimester. These both look great on you, and I'm loving the colors in the first one! Yes it's nice to have something that is comfortable right near the end! There is something really gorgeous about that shade of magenta. It definitely needs to contrast with something, I think blending it in would really be a disservice! You look great in both of these wrap dresses, and I adore your bag! <3 Hope you have a great week ahead! You always rock the printed dress look, pregnant or not :) speaking of which I really love your turquoise wrap necklace worn with outfit 1! Such lovely dresses!looks great on you ! Hey you can do a bright dress with a bright bag why not. Love the color and pattern of that first dress which could be worn for nursing and past pregnancy. I believe wrap dresses are not only flatering but super versatile and I am wearing one in my latest post, also. They are really versatile pieces, definitely. Your wrap dress are always on point. I love this and can see myself wearing it soon. Beautiful dresses! Wrap dresses are so great to wear. Not only are they comfortable, but they're so easy to just throw on when you're running late and it looks like you spent hours getting ready. Yes, they always look so pulled-together, even if you just threw them on, haha! Your wrap dresses are fabulous! I love the bright bag you paired with them. What a fun color! I do love how the bag really pops against the neutral dress! But since turquoise and pink are some of my favorite colors, I love the first look too. Gorgeous lady! very cute flats! darling looks as always! I think you've gotten your money's worth with those dresses and you can still get more.. until the last penny ;) that's the way all of our clothes should be. Definitely! Would be easy to wear them until they fall apart! Maybe not that maternity dress though, I got it second hand so this is the third pregnancy it's been through..it's indestructible haha! Just to let you know I was inspired by your bright magenta bag and bought myself a similarly coloured Michael Kors handbag! Thanks for the inspiration! You are such a glowing mama-to-be! If I ever get pregnant, I hope to look as cute as you do! I adore your first dress - It seems like wrap dresses are good for both during and after pregnancy! killing the wrap dress game! yay! you find the best wrap dresses and looking at your pictures makes me miss my prego belly! your dresses are really pretty!! and so do you! That was an excellent purchase Mica! Both are pretty. I love the way the first one wraps! Gorgeous tulip design at the bottom and fabulous print.